Bail reform is catching on in San Francisco, but not fast enough for some defendants. In theory, bail reform is ascendant in San Francisco. In practice, defendants are still locked up because they can’t afford to buy their freedom. Instead of starting his third semester at community college this fall, Quinntez Woodson sat in a San Francisco jail cell, held on $35,000 bail that he could not afford. He sat there for more than two months, waiting either for the start of his trial or for his family to collect enough money to get him out. During that time, he lost his apartment, his chance to study this semester, and his job stocking shelves at Walmart. In August, the 19-year-old was riding in the passenger seat of a friend’s car when they were pulled over in a routine traffic stop. According to court records, Woodson fled when officers approached the car. While trying to evade the cops, he threw an object wrapped in a red bandana under a car. The officers later recovered that object: a loaded, illegal firearm. After a few weeks in jail, held on a bond he couldn’t afford, the prosecutor on the case offered Woodson a deal: If he pleaded guilty to the felony charges against him for carrying a concealed, unregistered, and loaded firearm in a public space, they would let him out with a probation-only sentence. In other words, he could go home if he gave up his right to a fair trial. More than 90 percent of state and federal criminal cases are resolved this way. Bail reform advocates across the county—a cohort that now includes U.S. senators, county sheriffs, and elected prosecutors—tell this type of narrative again and again to illustrate the perverse role money plays in our justice system. In short, we punish people for being poor. If Woodson had the means to scrape together $3,500 for a bail bondman’s down payment, he could have fought the charges without sacrificing his housing, education, and job. Woodson’s public defender urged him to reject the deal and hold out for his day in court. “I advised him that for a young man his age, having a felony on his record is a really bad thing,” Chesa Boudin told me. Even if Woodson is found guilty, his lawyer could possibly argue that the charge against him should be reduced to a misdemeanor, which would be dramatically less harmful than a felony with respect to Woodson’s future job prospects, housing opportunities, and loan applications. * Persuaded by that advice, he decided to stay in jail. In the meantime, his family began to scrape together money for bail, asking everyone they knew. Last Sunday, eight days before his trial was scheduled to begin, Woodson’s grandmother bailed him out. What sets Woodson’s story apart from many others is that he is being tried in a jurisdiction where the top prosecutor is an acclaimed bail reformer. 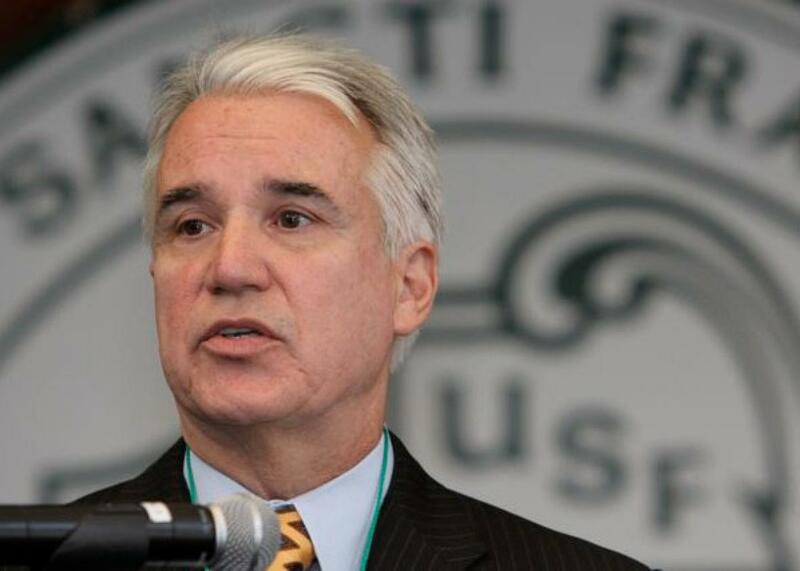 San Francisco District Attorney George Gascón has called cash bail “inherently unfair and archaic.” Earlier this year, San Francisco Chronicle columnist David Talbot described him as a “reform-minded activist” and praised him for showing “courage in defying powerful entrenched interests.” Cases like Woodson’s, though, cast doubt on whether Gascón’s rhetoric matches his line attorneys’ day-to-day actions. In large part, Gascón’s reputation as a reformer hinges on the role he played in bringing a risk-assessment tool to San Francisco courts. The Public Safety Assessment algorithm, developed by the Texas-based Laura and John Arnold Foundation, gauges a defendant’s risk of skipping town or reoffending before trial based on data including the person’s age, pending charge, prior convictions, and previous failures to appear in court. PSA is supposed to help shift the justice system away from cash bail. “The implementation of risk-based tools at key decision points is the next step for San Francisco to reduce disproportionate minority contact and continue to reduce our jail population safely,” Gascón wrote in a Huffington Post op-ed last October. California legislators are also considering the implementation of a statewide pretrial risk assessment system as part of a larger campaign to overhaul bail. Since San Francisco courts began using the PSA tool in April 2016, the rate of defendants released from custody before court hearings has doubled, from 29 percent to 61 percent, according to data provided by the DA’s office. And the percentage of defendants released after a bail hearing jumped 10 percentage points, from 17 to 27 percent. During this time, 20 percent of those released failed to appear in court, and 6 percent were rearrested for new crimes. That compares with 17 percent failing to appear in court and 16 percent getting re-arrested nationwide in 2009, the most recent year data is available. There may be some growing pains, then, when it comes to getting people to show up to court. But the re-arrest rate, more important to public safety, has been considerably lower in San Francisco than in the nation as a whole. Despite the huge increase in the rate of pretrial release on Gascón’s watch, defense attorneys say some line prosecutors still ask for money bail for defendants with very low PSA scores. Woodson, for example, scored a 1—the lowest score possible—for risk of missing trial, and a 2 out of 6 for risk of committing another crime. The tool recommended he be released on his own recognizance, without any court supervision. But the prosecutor recommended the judge set full bail, $75,000. “The defendant was essentially riding as a passenger in a car with a loaded firearm and then running through the streets of San Francisco with this loaded firearm,” the assistant district attorney, Traci Lee, said at Woodson’s arraignment, explaining why she was seeking full bail. The judge settled on the lower but still prohibitive amount of $35,000. Boudin says he sees this type of inconsistency all the time. “It happens every day. Not every case, but it happens in one case or another every day,” Woodson’s lawyer said. He hasn’t noticed a pattern in the types of cases in which defendants are held on cash bail against the PSA’s recommendation. “It has more to do with the particular district attorney—some of them just ask for bail,” he said. In a motion to reduce Woodson’s bail, Boudin explained his client’s backstory. The 19-year-old was raised by a largely absentee mother and a grandmother addicted to crack cocaine. At age 11, his mother was incarcerated. Woodson spent the better part of his teens living in shelters, on friend’s couches, the streets, and eventually in a group home. He has had run-ins with the law, starting at age 12, but legally that shouldn’t be counted against him now, Boudin argued. In all respects, Woodson was in the most stable position he’d ever been in. He was attending regular meetings with a social worker, was enrolled in school, and had two jobs, one at Walmart and another at an agency that provided professional training and support for former foster kids. Despite all this, the judge didn’t budge. It’s rare for a judge to go against a prosecutor’s recommendation in gun cases, Boudin explained. Woodson’s attorney didn’t stop there, going on to petition California’s 1st District Court of Appeal. On Oct. 12, California Attorney General Xavier Becerra responded that he agreed with Boudin that bail was not properly set, citing the judge’s failure to consider Woodson’s ability to pay, or alternative methods, such as court supervision, of ensuring he showed up to trial. Because this response is so fresh, it’s not yet clear how it will affect Woodson’s trial. A working group that includes members from both the San Francisco public defender’s office and the DA’s office meets monthly to discuss issues with the implementation of the PSA tool. Danielle Harris, a deputy public defender, is a member of this group. About a month and a half after the courts started using the tool, she voiced her concerns that line prosecutors were ignoring risk scores and continuing to ask for cash bail. In response, she told me, a high-ranking member of the DA’s office laid out a list of case categories in which prosecutors were allowed to ask for bail against the PSA tool’s recommendation, including when the defendant was not a U.S. citizen, when he or she suffered from mental illness or drug addiction, or if he or she didn’t have stable housing. “It was not suggested that ADAs should necessarily ask for bail for these reasons, just that they may. But they’re so broad that they sweep in a very large percentage of the cases that we’re talking about,” Harris said. Szabo denied that the DA’s office communicated these guidelines at the meeting or delivered them to staff attorneys in private. “The oversight of how [PSA is] implemented is virtually nonexistent. If we bring the management a specific example, they say that they’ll look into it. There is no indication that they are doing any internal review of fidelity to the policy,” Harris said. Szabo responded by noting that the DA’s office is in fact conducting a study into both the effectiveness and accuracy of PSA and its implementation by line attorneys. *This piece has been updated to clarify Woodson’s legal case.